Whether you're an entrepreneur or freelancer, working remotely as part of an international team enables many to live their dream lifestyle, make a 6 figure monthly income, while living wherever they want. But building international teams and working remotely comes with its own set of challenges. How do you find the right people? What is the market pricing for freelancers? What are the do's and don'ts, work culture and tools that ensure your team stay motivated and collaborate effectively? Is this the future of work? How do you overcome communication challenges and develop strong bonds even when your team members aren't sharing an office together? 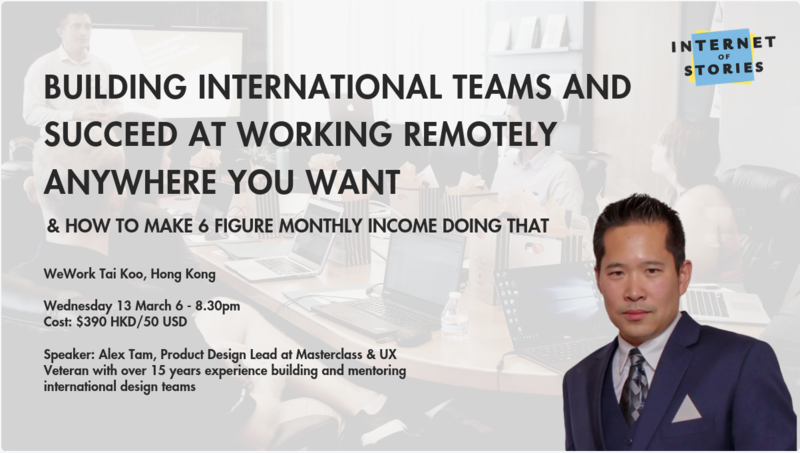 In this seminar, Alex Tam, Product Design Lead at MasterClass and UX veteran will be sharing his experience of building international teams for corporates and tech startups from San Francisco, New York, Australia and beyond, and how to succeed at working as part of remote teams while making a 6 figure monthly income. - Finding the right people for remote teams. - Setting your team up for success. - Taking advantages of time zones. - Establish your story and expertise. There will also be a Q&A session at the end where you'll have the opportunity to ask Alex any questions regarding Silicon Valley's product startup culture, building and working with remote teams, and his design team's work at MasterClass that in combination with consistently high quality production and educational content, makes it a world class product.